Is the Coast Guard Responsible for This Fisherman's Injuries? Home » Can This Injured Fisherman Hold the Coast Guard Responsible for His Injuries? Can This Injured Fisherman Hold the Coast Guard Responsible for His Injuries? After a three-day crab fishing trip, a crew was travelling home when their 63-foot boat ran aground on a shoal that was 300 yards from the shore. The boat was dangerously close to capsizing, so the crew radioed a distress signal, put on lifejackets and waited to be rescued. Though the water was only approximately four feet deep, the 20-mile per hour winds were creating seven-foot waves that hurled into the boat. Five minutes later, the Coast Guard arrived and lined up the stern with the fishing boat and urged the fishing crew to jump onto the rescue boat. Three fishermen made it to safety. However, one of the fisherman jumped when the Coast Guard commanded him to, but fell short because of a wave. The fisherman became pinned in-between the two boats, crushing his pelvis. He required multiple surgeries after the accident and remains permanently maimed. The Coast Guard filed a different account of the incident, saying they gave a command that was not followed and the fisherman lost his footing, getting his leg caught in between the vessels. What’s worse is the last fisherman needing to be rescued remained on the fishing boat after the incident and 30 minutes later, the boat washed ashore and the fisherman jumped onto dry ground unscathed. While the Coast Guard saves many lives and is necessary for when things take a turn for the worst at sea, there are instances where it can be held responsible for botching a rescue and putting those they try to rescue in even worse positions than what they were previously in. The Coast Guard is expected to carry out rescue missions with reasonable care. When they don’t, the results can be catastrophic. In the instance after the fishing accident, either towing the boat off of the shoal or monitoring the situation until it washed ashore may have been safer options. 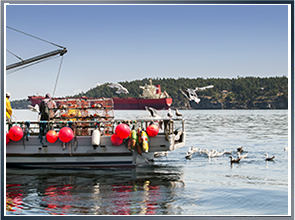 Latti & Anderson LLP is a maritime injury law firm that fights for those who are injured at sea.